RIDE THE WIND AND EXPLORE. It is spring, and outside the door is the sound of birds, back again, calling, fussing, and singing their nesting songs, a delight after their long winter's silence. Even "common" birds are uncommon, when seen in all their beautiful colors and lovely aerodynamic forms, and heard in all the symphony of sound which fills the warming days of spring with life. Helen Frost's narrative evokes poetry even in those lines in which the random rhymes of the text do not appear, and photographer Rick Lieder's painterly eye reveals the startling beauty of these creatures, their wings translucent in the sunlight, their feathers as full of light as Monet's brushstrokes, the arc of their wings as sculptured as a Michelangelo figure. Frost and Lieder offer up portraits and lyrical descriptions of eleven familiar backyard birds--the jay, cardinal, goldfinches, and woodpeckers in their eye-catching plumage , as well as their drabber brothers, the sparrows and starlings, summarized in the appendix with thumbnail photos and information. 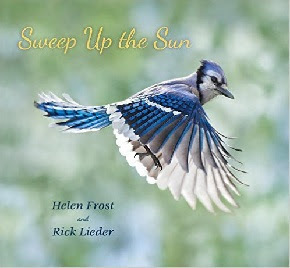 Frost's and Lieder's Sweep Up the Sun (Candlewick Press, 2015) is a nature study book for all seasons and uses--poetry, art, animal science, and inspirational text. In their starred review, Kirkus Reviews describes this book as showcasing "the splendor of nature through the happy marriage of literal and figurative images." and School Library Journal adds "A superb intersection of science, literature, and visual arts." A blog which offers book reviews for young people of preschool to high school ages by a children's librarian with decades of experience in reading guidance. Retired after 32+ years as an elementary librarian, I really miss the joy of bringing together the right book with the right reader at the right time. Loving both kids and books equally as I do, perhaps helping children and the adults who care about them find good books through this blog is the next best thing to being there. I am an Amazon associate, which means that clicking on the image of a book I reviewed or on the title of any book mentioned in the review will take you to full publishing and purchasing information, as well as other reviews and comments for most books. I also receive review copies from publishers or authors from time to time, with no implied promise that the books will be reviewed favorably or at all.